The great smokys is a very nice peaceful vacation. The moonstruck cabin is beautiful & upholds every description. The host is outstanding & very helpful. I would definitely recommend staying to anyone . No complaints at all it was wonderful & worth every penny. I guess this is our last night here... We really enjoyed our weekend. Thanks to my future husband for the surprise. I didn't know he was bringing me to the mountains. Beautiful cabin and the Hot Tub was awesome. Can't wait to come back, hopefully for a week or two. The cabin was perfect; very clean and well equipped. We loved hanging out on the covered deck and taking a soak in the hot tub. Location is very good, secluded yet close to town. This was exactly what we were looking for. We have absolutely loved our stay here! The amenities have been great and our family has had a blast! We hope to be back very soon. As we are leaving today,a beautiful blanket of snow is falling. We had a great weekend getaway. So very nice and relaxing. We enjoyed the indoor fireplace Every time I called GSCR they were very knowledgeable and very helpful. Had a great time. Enjoyed the cabin and hiking in the park. The setting was very woodsy and private. We loved the porch and enjoyed our getaway! Came here for vacation after a busy summer. We are both teachers working second jobs and taking college courses . Just needed a place to unwind. Would highly recommend making the hike to Clingmons Dome - nothing like walking in a cloud. Loved drinking coffee and wine on the porch. Hot tub was relaxing after hiking. We love it here and hope to come back soon. Really enjoyed staying at this cabin. This was our first time staying so high up on a mountain. We will definitely plan another trip! The cabin was very clean and relaxing. Staff is very friendly and helpful. We enjoyed relaxing in the hot tub. We hiked tot he waterfalls at Deep Creek and drove out to the Road to Nowhere. Beautiful scenery. We need this much needed getaway! The cabin was very clean and is more beautiful than expected, it is very 'homey'. We loved the deck and the fireplace. The cabin is so conveniently located. Just a very short drive to the entrance to the Great Smoky Mountains at Deep Creek. Deep Creek has a variety of hiking trails. Also, the closeness to Bryson City was great. Very nice town. The members were so helpful. We even called a couple of times asking for information about Bryson City and surrounding area and they were very helpful. We arrived early and called about the possibility of entering the cabin early. The staff checked to be sure the cabin was cleaned and gave us permission to check in early. After a long drive that was very nice. It was an amazing week. We enjoyed the fire place and covered porch. Actually saw bears off the porch in the woods. We did a lot of hiking and relaxing. Lovely place to host a reunion. So many family games and conversation, relaxation and great meals. Thanks for all the work you put into making the cabin great. We enjoyed out stay very much at the cabin. The beds were very comfortable. So much so that we slept in every morning. The view was beautiful. 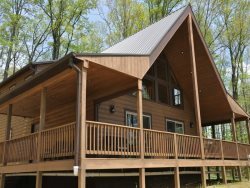 We had a great stay at Moonstruck Cabin. We went hiking in Sylva, white water rafting. We grilled our, enjoyed the hot tub and the porch swing. Such a Memorial Day Getaway.